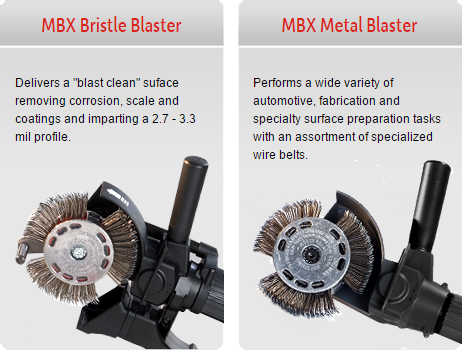 MBX Bristle Blasting technology brings an entirely new performance level to power hand tool cleaning for industrial steel surface preparation. Now, a "blast-like" clean can be achieved for spot repairs or where abrasive blasting is not economically feasible or is prohibited. 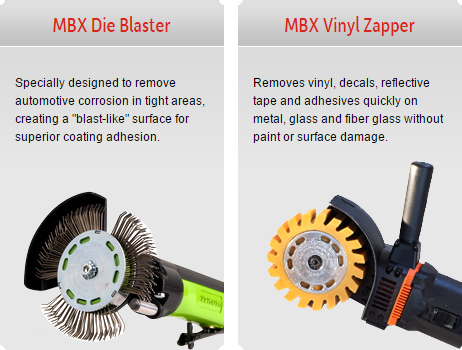 The MBX Bristle Blaster incorporates a specially designed rotary tool with dynamically tuned bristles that impact the surface and immediately retract to prevent grinding and polishing. The patented accelerator bar creates a strike with kinetic energy that is equivalent to grit blasting. You can read more about MBX Bristle Blaster here. Use the Bristle Blaster for a variety of applications! Removes corrosion, mill scale and protective coatings - Surface cleanliness with Near White/White Metal appearance - no grinding or polishing during operation. Creates a 2.7 - 3.3 mil surface texture/anchor profile - Benchmark steel is API 5L pipeline steel - profile will vary with hardness of substrate. Welding cleaning - pre and post. Creates clean, profiled surface without removing metal. Surface preparation for spot repairs, cut backs, and feathering applications. The Bristle Blaster Has Numerous Advantages. Removes coating and corrosion without removing healthy material. Improves integrity of treated surfaces Generates compressive residual stress along treated surfaces providing crack growth resistance, improved fatigue live and improved corrosion resistance. Negligible heat generation - treated surfaces free of thermal damage and/or heat markings. Excellent mobility without the need for complex equipment, work-suits, breathing apparatus and grit recovery systems. A "Green" process - does not use/produce environmentally unsafe or hazardous material. C 2018 Robert Lukas Enterprises, Inc.